Syntech supports the manufacture of a wide range of assemblies including complex, high-value boards, destined for environments demanding extremely high quality and reliability. Most contain devices such as microprocessors, microcontrollers, FPGAs and CPLDs, which challenge traditional in-circuit test by providing limited probe access to signals or device I/Os. 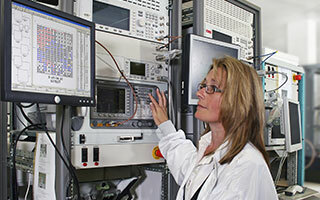 To reach high targets for test coverage, Syntech applies extensive functional testing. Most functional test routines, however, are relatively lengthy. To maximise efficiency and productivity, Syntech sought a fast way of screening boards to identify defects such as shorts, opens or component failures before beginning the functional test routine. Checking the connectivity of a complex board can take several hours using manual techniques, so Syntech’s engineers decided to use boundary can testing to achieve their goal. XJTAG performs functions including interconnect testing as well as in-system programming, and handling serial numbers. It can also pinpoint the locations of discovered faults, which helps to simplify and speed up board repairs. When completed, the tests are exported to the XJRunner system, which tests the production boards on the factory floor. XJRunner is an economical multi-seat XJTAG system, which is optimised for production use and provides run-time capabilities. XJTAG has become an integral part of Syntech’s test strategy, and is able to communicate test results to a central database for product history tracking. XJTAG delivered the best value among available boundary scan systems, offering all the features we required and very good technical support. We are using XJTAG throughout our entire development path, from pre-hardware to full production. Tests are easy to write and can also be re-used on different boards. We can test many types of non-JTAG devices that are not directly connected to the boundary scan chain, pinpoint the locations of faults to speed up repair, program devices on board, and manage serial numbers. The system also integrates well with our other test equipment to help maximise test coverage. The UK-based Electronic Manufacturing Services (EMS) provider Syntech Technologies offers strong engineering skills including RF design and test to customers in the military, communication, medical and commercial sectors. Services include Design for Manufacture (DFM), Design for Test (DFT), prototype and New Product Introduction (NPI) services, as well as competitive volume production, box-build, design support, and product repair and upgrade.